Applications module Create an element (e.g. 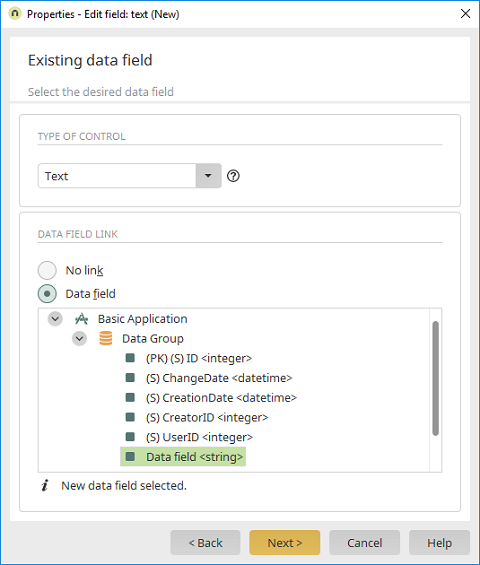 edit field) Link to existing data field / Click on "Next"
Depending on the data type of the data field connected here and the current element, different control types can be selected in this dialog. Displays a short explanation of the selected control type. Formats the content according to the settings made on the Options tab. Can be used for data fields that contain email addresses. The content is formatted as a link. Clicking on the link opens the standard mail client and automatically adds the email address as the recipient's address. Can be used for data fields that contain URL. The content is formatted as a link. Clicking on the link opens the default browser and automatically loads the corresponding page. The content is shown as a link that can be used to send an SMS or establish a telephone connection with automatic phone number entry. The corresponding settings can be made on the Options tab. The content is transformed into a link to web applications. On the Options tab, parameters, e.g. target, can be assigned. Displays the image that the URL leads to according to the settings made on the Options tab. The surface of the view field is filled with the color that is specified as a hexadecimal in the connected data field. This control types enables you to embed videos from the portals YouTube, "Vimeo" and "myVideo" based on the URL, as well as a range of video file formats, images and typical URLs. Supported formats for videos: swf, mp4, ogg, ogv, oga, ogx, webm, mkv, mov. For images: jpg, jpeg, png, gif, bmp. The number is formatted according to the settings made on the Options tab. Can be used with data fields that contain the user ID. The view field displays additional user information according to the settings made on the Options tab. The tree path is formatted according to the settings made on the Options tab. The date is formatted according to the settings made on the Options tab. The time is formatted according to the settings made on the Options tab. The date and time are formatted according to the settings made on the Options tab. Information about control types that can only be used in view tables can be found here. The element is not connected to a data field. With this option, a data field is connected to the element. Simply select the required data field in the application structure pictured beneath.